Long after her divorce from Joe DiMaggio, Marilyn Monroe remained close to her stepson, Joe Jr, speaking to him on the telephone hours before she died. Sadly Joe Jr had a difficult life and could never escape his father’s shadow although Joe Sr tried to support him as best he could. 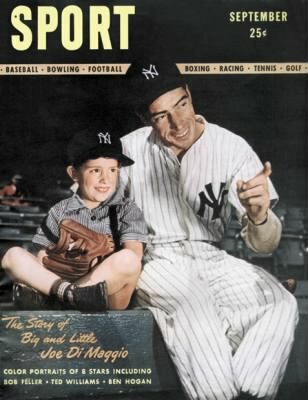 Joe Jr died, ravaged by years of alcohol abuse, just six months after ‘the Great DiMaggio’. “Joe’s happiest days may have been those that he spent with Marilyn Monroe. One early fall day, just as we all had returned from our summer vacations, Joe told of his stepmother Marilyn making his breakfast and serving it to him. I have often thought that if Marilyn had lived longer, she might have been able to help Joe Jr. His father was a distant, reserved man, as Marilyn knew all too well. Joe Jr’s mother was DiMaggio’s first wife, former showgirl Dorothy Arnold. Marilyn, who came from a broken home herself, never tried to replace Dorothy but was sensitive to her stepson’s emotional needs. Next to DiMaggio, Joe Jr was perhaps more hurt by Marilyn’s untimely death than anyone else.